Emission components could be covered under warranty for up to 8 yrs or 80,000 miles, whichever occurs first, under federal law. 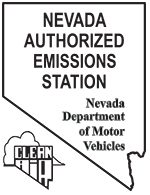 See EPA Emission Warranty Information. To renew the registration each year, you must complete the Odometer Certification for Emission Exemption (EC 18) to certify that you have driven the vehicle 5,000 miles or less. Bring the completed application, the EC 18, any existing license plates and your Nevada Evidence of Insurance card to a DMV office. If you wish to keep the old plates, you must bring the rear plate and surrender the decal in person.